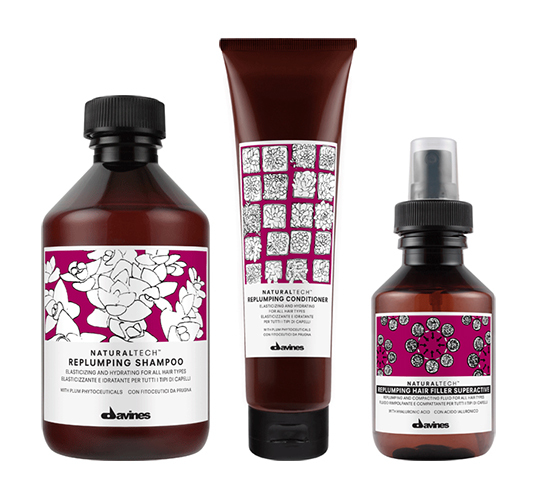 Davines has given value to the goodness of every single formula, enriching it with active ingredients from Slow Food Presidia farms in Italy to contribute to the protection of biodiversity on our planet. The formulas contain high percentages of ingredients natural derived and read-bio-degradable. They minimize their impact on our environment while also combining sustainability and high-performance results. Essential Haircare shampoos are formulated with mild surfactants that respect the hair while creating an incredibly creamy, compact lather that rapidly dissolves in water, and are sulphate free. All products are paraben free. Each Essential Haircare family has a specific characteristic and function: nourishment, hydration, volume, shine, protection, elasticity, smoothness, daily care. They do what they say and all have the common goal of protecting hair from external aggressions and providing an immediate, visible result. Our stylist Andrew preformed a volumes blow-dry on his model Laurene. This is what he had to say about his favorite Davines products.